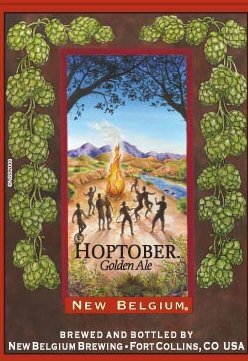 "Five hops and four malts make Hoptober Golden Ale a veritable cornucopia of the earth. Pale and wheat malt are mashed with rye and oats to create a medium-bodied ale with a creamy mouthfeel. Pours a faint straw color with a pillowy white head with good retention that thick but non-persistant rings of lacing behind. Body clarity is high and carbonation levels are fairly low. Initially, an earthy hop presence overpowered our nose. Quickly following was a light fruity presence peaking through, with hints of citrus (oranges and lemons). As expected, the malt body was very light and crisp. The aroma was very balanced. Initial taste is citrusy with some sour grapefruit notes and the finish has some dense earthy flavors. With a light to medium body, the Hoptoberfest was a bit watery with a soft bitter presence. The hops are quite drying on our plates, creating a unique light beer experience. There was a very active carbonation mouthfeel. The 6% alcohol presence was masked by the hops and malts. Astonishingly aromatic and overachieving in taste, this brew caught us off guard and continued to surprise. Great nose, great taste, pleasant finish...this one was knocked out of the park.